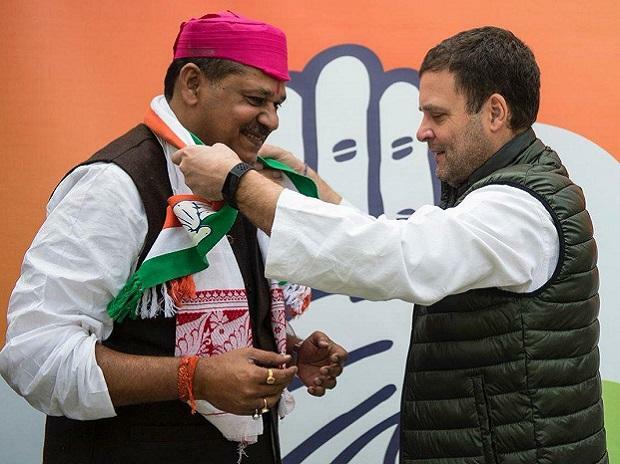 Terming it his "ghar wapsi" (homecoming), Darbhanga MPKirti Azad joined the Congress on Monday and slammed his former party BJP for its alleged lack of internal democracy and for peddling in rhetoric. Azad, who was suspended by the ruling BJP for anti-party activities, met Congress president Rahul Gandhi in the morning and was inducted into the party. Addressing a press conference later in the day, the 60-year-old former India cricketer said he served the BJP selflessly for 26 years, but under the Modi government he realised that the "real face behind the mask had started to become evident". "I felt bad when I heard jumlas, I saw corruption...I felt that the place where my father started his political career and served, I should also do ghar wapsi and serve there. I have made a ghar wapsi," he said. The Lok Sabha MP from Darbhanga is the son of late Bhagwat Jha Azad, a veteran Congress leader who also served as Bihar chief minister for a brief period. Azad, a member of the 1983 World Cup winning team, was suspended by the Bharatiya Janata Party (BJP) in 2015 after he levelled allegations against Union Finance Minister Arun Jaitley in connection with alleged irregularities in the Delhi and District Cricket Association (DDCA). On Monday, he raised the issue again and claimed he had 400 official papers to show that there was corruption in the private entity. "The party had nothing to do with the body (DDCA), the government had nothing to do with it. I was talking about Rs 400 crore corruption in the body. I felt bad that my voice was not heard in the party," Azad said. He also hit out at Prime Minister Narendra Modi over his statement, 'Na kahunga na khane doonga' (will not indulge in graft, neither will let others do so), saying the party that talked about fighting corruption "back stabbed" him on the DDCA issue. "Then I had understood that like other things, 'Na khaunga na khane doonga' was also a jumla," he said. "Internal democracy in the BJP is finished. Nobody is willing to listen to you. The Congress is like a family to me and I am very happy that I am back," the cricketer-turned-politician said. He also raised the Rafale issue, claiming that even people in the BJP raise doubts over the fighter jet deal. The government lied to the Supreme Court in an affidavit on the Rafale deal, he alleged. Azad also claimed BJP leaders had come to him recently and said an internal survey had shown he would win from Darbhanga. He said they "offered" him the Darbhanga seat and forget about the past. To a question on Tejashvi Yadav, Azad hailed the Rashtriya Janata Dal leader as dynamic politician with a bright future. On whether he was switching ideologies, Azad said he never followed the RSS ideology and always believed in uniting people. "Was inspired by Atal Bihari Vajpayee and L K Advani when I joined the BJP. There is big difference between the old BJP and the one that is there at present," he said in response to another question on shifting his allegiance to the Congress. He attacked the prime minister over the Pulwama attack, saying: "I want to remind the prime minister of his statement... he had said he will get ten heads in revenge for one." "I played cricket for the country's pride and honour. There is nothing bigger than the country for me. I want to remind him (the PM) that if he has got even one head as revenge, he should tell us," he said. AICC general secretary Bihar-incharge Shakti Sinh Gohil welcomed Azad into the party and said that it was not possible for any person with self-respect to stay in the BJP under Modi and party chief Amit Shah. Azad, who is currently serving his third term in the Lok Sabha, was to officially join the opposition party on Friday, but the programme was cancelled in the wake of the Pulwama terror attack.